From the roof of his family's home in East Jerusalem within the walls of the Old City, Raed Sa'id points to the golden Dome of The Rock, which is glowing in the late-afternoon sun. "This view is what I will miss most," he said. Soon after, his brothers smashed the walls and ceiling of the second floor of their home to pieces. Palestinian residents of East Jerusalem face many bureaucratic challenges to obtain building permits and often must choose between building illegally or moving out of the city. Around 1900 Palestinian houses were demolished from 2000-2007 for lack of a building permit, according to the Israeli Committee Against Home Demolitions (ICAHD). Amir Paz-Fuchs of the Israeli non-profit Bimkom estimated that on average for each month during the past three years, Israel's Civil Administration has given an average of 60 demolition orders, demolished 20 structures, and granted just one building permit. The Sa'id family of 13 children and grandchildren built a second floor room onto their existing single floor structure to accommodate the growing family of one of the brothers. Since they didn't have a permit, Israeli authorities gave them a choice – pay a large fine and the Israelis would demolish the area or pay a smaller fine and demolish it themselves. "Home demolitions are a part of Israel's long-standing depopulation of East Jerusalem through the abuse of the permit system," said Karin Ryan, director of the Carter Center's Human Rights Program. "Palestinians face many obstacles such as excessive fee for building permit application, the rezoning of land to be in areas not designated for development, and disproportionate fines for those who do build illegally. The Carter Center promotes a two-state solution, and every plan for peace involves East Jerusalem remaining in the hands of the Arab community." Israelis face the same application procedures for building permits as Palestinians in East Jerusalem, yet since 1967 Israel has sponsored the construction of nearly 50,000 units for Israelis only, while fewer than 600 government-sponsored housing units have been built in the Palestinian sector, with the most recent being 30 years old, according to the Israeli non-profit Ir Amim. Meanwhile, Israel is resisting pressure from the United States to freeze Jewish settlement expansion in East Jerusalem and other parts of the West Bank. They say they must build to allow for "natural growth." "But since the 1993 Oslo Accords, Israeli settlers in East Jerusalem have increased by more than 170,000, which indicates much more than just a natural increase in families already living there," said Ryan. On June 14, Jamal Sa'id, Raed's father, went to court to seek a reprieve for completing the demolition at his family's home. They had run into difficulties when destroying the ceiling and weren't sure how to bring it down without damaging the rest of the house. He was granted three additional days to destroy the structure and fined an additional 10,000 shekels (around USD$2600) for not completing the demolition within 24 hours of the deadline. President Carter has been committed to peace in the Middle East since his White House administration. In the decades following, President Carter and The Carter Center have continued to promote stability and justice in the region. The Carter Center is a strong supporter of the Geneva Initiative, a comprehensive joint effort between influential Palestinians and Israelis that promotes a two-state peace plan. The Carter Center has monitored Palestinian elections in 1996, 2005, and 2006, and has an office in Ramallah and Gaza to promote human rights, electoral reform, and conflict resolution. 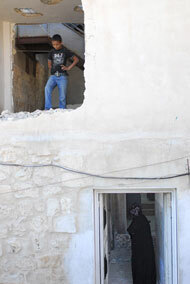 Thirteen-year-old Ahmed Sa'id looks down at what remains of the second floor of his family's home, while his mother walks away. Friends helped the Sa'id family demolish the second floor of their home this week. Since they built without a permit, Israeli authorities gave them a choice – pay a large fine and the Israelis would demolish the area or pay a smaller fine and demolish it themselves. Around 1,900 Palestinian houses were demolished from 2000-2007 for lack of a building permit, according to the Israeli Committee Against Home Demolitions. The Dome of the Rock in Jerusalem's Old City, viewed from the roof of the Sa'id family's home before the second floor was destroyed. After hearing about the Sa'id family, President Carter visited them to learn more and to give them encouragement that the world knows about their situation and many other demolition stories like theirs.